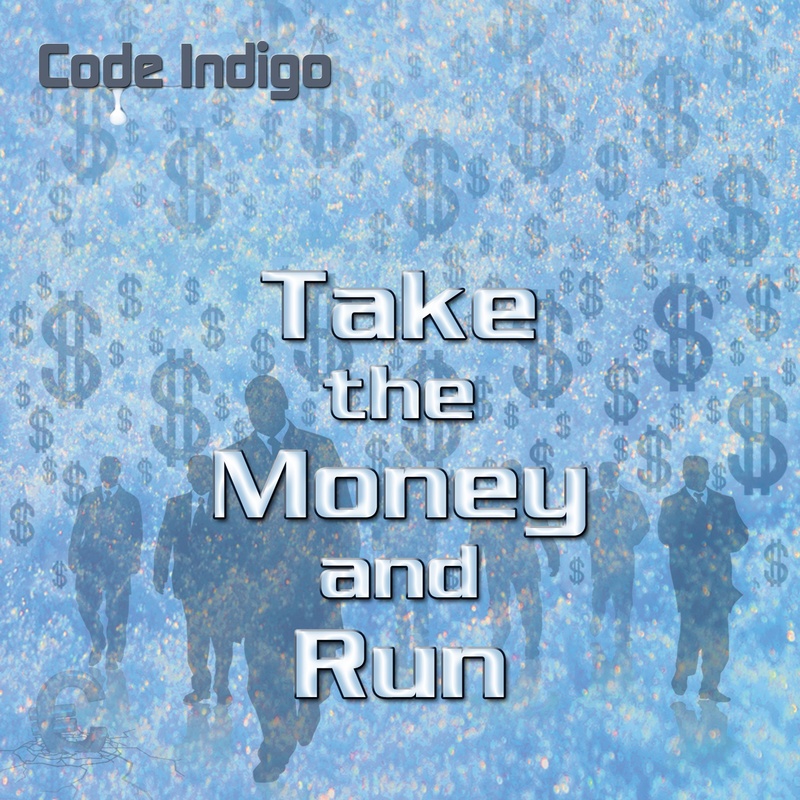 An update on the release date for the Code Indigo CD/DVD project ‘Take the Money & Run’ . The release date will be 14th February, 2 weeks later than previously advised, so apologies for yet another delay, which is completely unavoidable and down to the production house lead time. What I can confirm though, as previously reported, is that the DVD is just about signed off now and contains 86 minutes of stunning imagery from the mind of Nigel Turner-Heffer – what an incredible job he’s done on this – it’s gonna blow you away, I guarantee. It’s interspersed with live footage from eday and the dress rehearsal recorded by Winfried Wiesrecker presenting a great live alternative version of the ‘MELTdown’ album. The CD is also just about complete now, with final tinkering taking place this week. There are 6 tracks, although one piece is a previously unreleased 30 minute live, 6 part epic. Track listing is as follows. Sound bites will be up on the AD Music website later this week. A reminder that the double CD/DVD version with 12 page booklet is ONLY available if you pre-order before 31st January 2014. Thereafter only the CD will be available as a single item with 8 page booklet. So make sure when you order that you order exactly what you want – ie the CD/DVD double package or just the CD – both are listed on the AD Music website. But whatever you do, if you want the DVD you must pre-order before 31st January from the AD Music website. If you have any questions then please email AD Music. ~ by admusic on January 6, 2014.
the AD Music telephone number is on all the AD Music CDs and is 01986 894712. I sincerely apologise for the delay with this release. It has been beset with technical problems that we simply had no idea would arise when we first started it. Also, life has thrown numerous curve balls at us, including Robert Fox’s stroke and serious ill health issues for another member of the band. The latest delay has been caused, ironically, by the weather! I don’t know what else to say to you? We have made all best efforts to keep everyone up-to-date via email and this blog and trust me, no-one is more upset and embarrassed by the delays than I am. A huge amount of time and effort has gone into the project and we wanted it to be good, as much for you the fans as for us. As a point of clarification, the initial release date was to be Early December 2013. The pre-release idea was intended to help us the the project off the ground and to save fans some money purchasing the two items together. The original delays were due to the problems mentioned earlier and we had hoped to meet the January release date but circumstances beyond our control prevented this. When the release was finally ready, the current weather happened, causing severe damage at the pressing plant. As you will see from the latest post, the delivery for the CD is now confirmed as 7th March and we will ship the CD to you them. In the meantime, we will ship the DVD to you on Monday. Again, I can only apologise because I know you have supported me for 25 years but conversely, and we have had many conversations via email over the years and if you were still on email I’m sure we would have had more contact over this and you would feel less disgruntled. So, please bare with us for a short time longer, The DVD will be posted on Monday and The CD will follow on 7th March. I’m actually 15 minutes away from you at the moment (Saturday 22nd) in Chichester! I’d be happy to pop in and say ‘hello’ and explain in person what has been happening, but will not just turn up ‘unannounced’. If you want to call me you can get me on my mobile which is 07790445757. I just spoke to Elaine who is still in Suffolk, and she received your letter yesterday. She wrote back and you should have received her reply today. I can only re-iterate that we didn’t know you were no longer on email, so we had no way of knowing you were not receiving the updates. We also had no reason to think you didn’t know our number as it is in all the CDs. Also, the telephone number you gave us is unobtainable – you wrote 07055558516 (or 76, we cant decipher) but neither are correct. So we cannot contact you by phone. I’m surprised you don’t know us better after all these years and would think we’d just ignore your concerns? Perhaps you can get access to email and send us your correct telephone number, or contact either Elaine at home or me on my mobile?